FABRICLIVE returns with another three-room slammer showcasing the best in upfront drum & bass and bass sounds. In Room One, we host a debut showcase from one of the RAM family’s staples as Culture Shock brings Sequence to the space. For his first party with us, he brings his floor-driven sound, joined by a special guest to be announced soon. They’re joined by a cast of the genre’s leading forces in high-charged 170BPM fare, with More Than Alot signee 1991 lined alongside Hospital mainstay Grafix, and one of the stars of Shogun Audio, Icicle. Limited, QZB and The Upbeats stop by to round off the bill, with Ben Verse and Carasel taking on hosting. In Room Two, we head on a techy tip as neurofunk specialists Neosignal celebrate their 10th anniversary. To mark their milestone, they dive in at the darker end of futurist D&B with a billing perfectly suited to our cavernous Room Two dancefloor. Label founders Phace and Misanthrop are joined by Rockwell, the UK producer behind some of the most individualist drum & bass records of the last decade. Two of the key faces on Neosignal offshoot imprint NЁU, Signal and Stoner also land. Plus, Shogun Audio duo Was A Be drop in, with LowQui on mic duties. 877 Records take over Room Three. 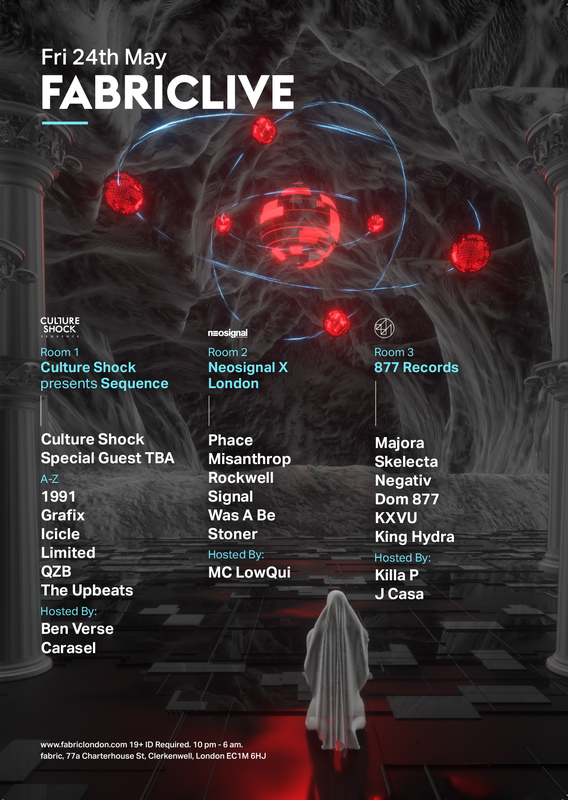 The bass experts have proven their standing within the UK’s underground scene since 2011, and their first night with us is set to feature the label’s core crew of artists. Majora, Skelecta, Negativ, KXVU and King Hydra all join Dom 877 behind the decks, with Killa P and J Casa hosting the proceedings to round off a heavy duty bill.